If you understand the importance of marketing a business, you probably already know why a business website is important. Unfortunately, many small business owners who are starting their own company will put their focus on other parts of operation rather than website URL’s and landing page design. The statistics show that only about half of established small businesses have a website, according to INC. The remaining half that have chosen to bypass the modern day tech revolution are missing out on clients and exposure. Here are some of the many reasons why having your own professional website is important. With all of the different brands competing to earn the business of consumers in every industry, it can be very difficult to get brand exposure. Consumers are flooded with so many different logos and slogans on billboards, the radio, shopping carts and everywhere they turn. While these marketing tactics will get their brand exposure, having a website will help you build brand recognition with consumers are actively searching for a company in your industry. If you offer local services or you are selling products via the world-wide-web, you need a branded business site that shows you are a legitimate business and that will communicate the message you are trying to send. One of the amazing things about the Internet is that you can appear to be what you want to be. In a brick and mortar store, consumers are going to see with their very own eyes that you have a small little shoppe and that you run a two-man operation. When you have a professional website that you direct prospective clients to, you can appear to be much larger and more credible. You may only have two staff members, but if you have a well-designed site, you can level the playing field and compete with those huge players in your industry. Size may not always matter, but it is important when consumers see larger companies as more trusted brands. Business websites may give your customers the information that they need to contact you, but they are also low-cost advertising platforms that can earn you money if they are used in part of your marketing strategy, according to the Houston Chronicle. By committing time to create an online presence and optimizing your website, you can reach out to a widespread audience of consumers who may or may not have a need for what you offer. The key is to create content that readers can benefit from and can relate to. As you begin to drive traffic to your site, you will build relationships with people who may choose to do business with you. In online marketing, this is called a conversion and this is what earns you money. 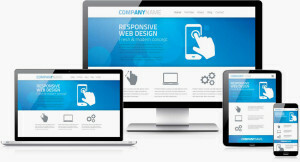 Without a website, your company is not easily accessible or visible to the world. It may cost money to build a site and to keep it live, but those small costs are worth what you get in return. To successfully build a business and then expand that small business, you must first understand why a business website is important to growth in the modern world.